White socks are only for sports: One of the most drastic rules of fashion- wearing white socks. If you're gyming then white socks are fine, and actually, look better than black socks, if you're playing sports or going for a run. Apart from activities, white socks are a big NO. Prefer wearing black socks with jeans. Therefore, keep your white socks close to your workout outfits and away from your dress wardrobe. Dress shoes require dress socks: If you're thinking to wear dress shoes, you can't wear athletic socks, no matter what their color is. Reason being athletic socks are bulkier than dress socks because they are made of heavier cotton, so they tend to bunch a little over dress shoes. So, wear dress socks with dress shoes because they will be easy to slip into your shoes, thus, giving you the finest look. Match your socks with your pants, not your shoes: The color of your socks should be matched with the color of your pants but not with the shade of your shoes. Brown pants should go with brown socks and black pants with black socks. The same contrast will go for gray and blue pants. But if you are in doubt, a darker color always works better. The reason to match your socks with your pants is when you have to remove your shoes or sit down, your socks are exposed, so coordinate your pants with your socks and make your outfit appear to be perfect and decent. If your socks don't match with your pants it will break up your ensemble. Don't roll or fold socks: Rolling down your socks around your ankles will make you look sloppy and bulky especially when you are wearing slim cut pants. So, wear your socks pulled up, doing this will create a lean and coherent silhouette even with the narrow leg pants. Replenish Socks often: Make a habit of buying, at least, three socks new pairs of socks because socks go through a lot of wear and tear and since they are not made of the best quality material, they easily get holes. Socks with holes make you seem like you are lazy to go to the store for buying yourself a new pair of socks. Thus, socks that are having holes or are worn out will make your outfit look devastated. Avoid Socks with shorts: Another common mistake is wearing socks with shorts. Firstly, committing this crime will make your look sloppy and sluggish. Secondly, wearing socks with shorts cuts your leg in half, thus making your legs appear shorter. 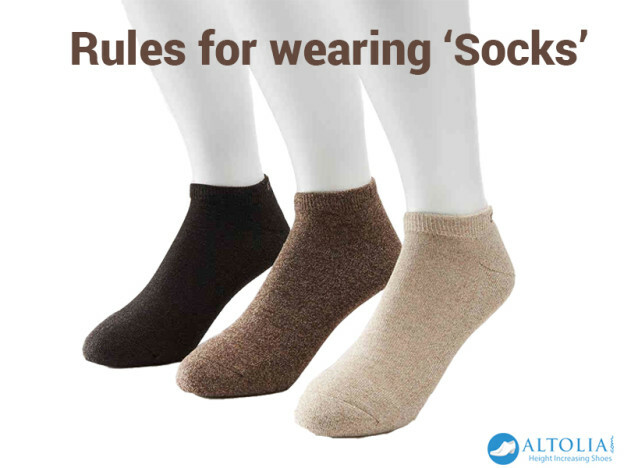 But if you still want to wear socks, then you can invest in a pair of ankle socks which is not overly visible when you wear them with canvas or sneakers. Sock rules are not numerous, there are many people who break them everyday. Thus, picking the right socks is not that tricky and now you know the dont's of wearing sock etiquette, selecting the best pair of socks will come naturally and you'll never make a bad choice again.